Schneider's Sweet Shop and chocolate factory is located in Bellevue, Kentucky, just across the river from Cincinnati, Ohio. Founded in 1939 by the Schneider Family, Schneider's originated as an old-fashioned neighborhood candy and ice cream store. Since Robert Schneider was the only experienced candy maker in the family, he and his wife Lill took sole ownership of the business shortly after it opened. Using his years of experience, time-tested recipes and only the best quality ingredients (taking no short cuts! ), Robert's reputation and Schneider's Sweet Shop soon flourished. In 1986, after almost fifty years in the candy business, Robert retired. Robert's son, Jack, who worked beside his father for twenty years, took over the family business with his wife, Kathy. Jack and Kathy have carried on Robert's theory that customers want and deserve quality. To retain that old-fashioned quality and freshness, the candy at Schneider's is still made the same way with the same tried-and-true recipes. Their most popular item unique to the Kentucky area has always been their Opera Creams. Other specialties include Fudges, Caramels, Cordial Cherries, Pecan Caramelettes (turtles), Kentucky Cream Candy, and so much more, all home-made right on the premises. 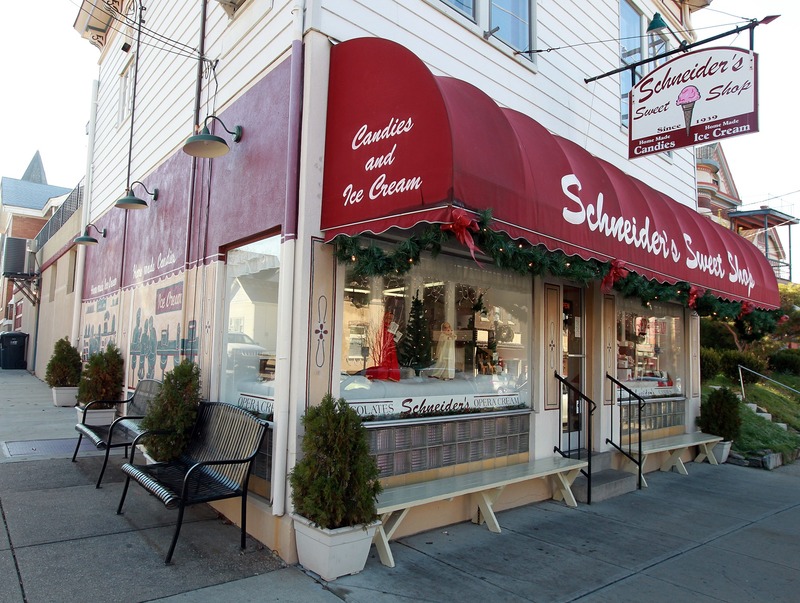 Schneider’s Sweet Shop is also known for their amazing home made ice cream and ice balls. With a complete soda fountain, they also serve malts, shakes, floats, sundaes, banana splits, and so much more. Schneider's candies make great gifts for any occasion or holiday. These would include a beautiful heart for Valentine’s Day, a personalized egg at Easter, summer and holiday flavors of ice cream, home made caramel apples in the fall, and assorted chocolates or opera creams for all your Christmas or any holiday needs. At Schneider's Sweet Shop, no order is too big or too small. 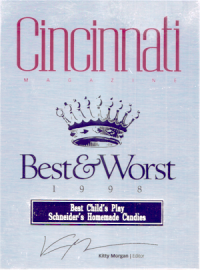 If you can’t stop by to visit at 420 Fairfield Ave., Bellevue, Ky. 41073, be sure to check out some of our candies and place an order on our web store , or call us at 859-431-3545. Our store hours are Mon-Sat 10am - 8, 9 or 10pm, and Sunday noon - 8, 9 or 10pm (hours are seasonal). 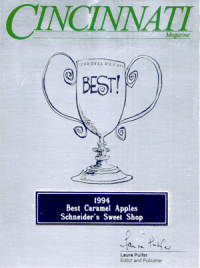 Schneider's Sweet Shop is truly a delicious piece of local history that is not to be missed! !